Josephine and I. Five Stars. The Bush theatre has done it again. Got me on my feet giving a standing O. This time for a tour de force called Cush Jumbo who has written and performs a marvellous piece based on Josephine Baker the black American dancer but cleverly intertwined with what appears to be her own life. I would watch Cush Jumbo in anything after this. She is beautiful, magnetic, mesmerising, likeable and able to transport us to Josephine’s childhood home of St Louis, through New York, on tour, to Paris and back to the States whilst playing every character. She switches accents, becomes drawling men and transmogrifies in an instant. And through it all she weaves the present day as we are appalled at the racisim she suffers as Josephine and even as her modern self. The Bush is transformed in to a nightclub for this performance so if you are lucky enough to have tickets, take your drink in early and bag a great seat. I sat through the 100 minutes without taking my eyes off her. I’m not sure I even drew breath. Loved it. Five stars. Three in to one does go! After a fairly heavy girls night out on Friday, I was unable to get up in time for step class but mentally excused myself as had to get ready to re-visit the Olympic park for an afternoon of athletics. Way hay! I blogged repeatedly about the fabulous Jubalympics last year and was pumped for revisiting the park and seeing the stars of track and field. Now called the Queen Elizabeth Olympic park, the walk to the stadium is no longer flanked by a clear run from the tube station, but a busy working Westfield with walkways narrowed by restaurant tables and chairs or ropes to cordon off the queues for various shops so we are funnelled down to a few abreast. 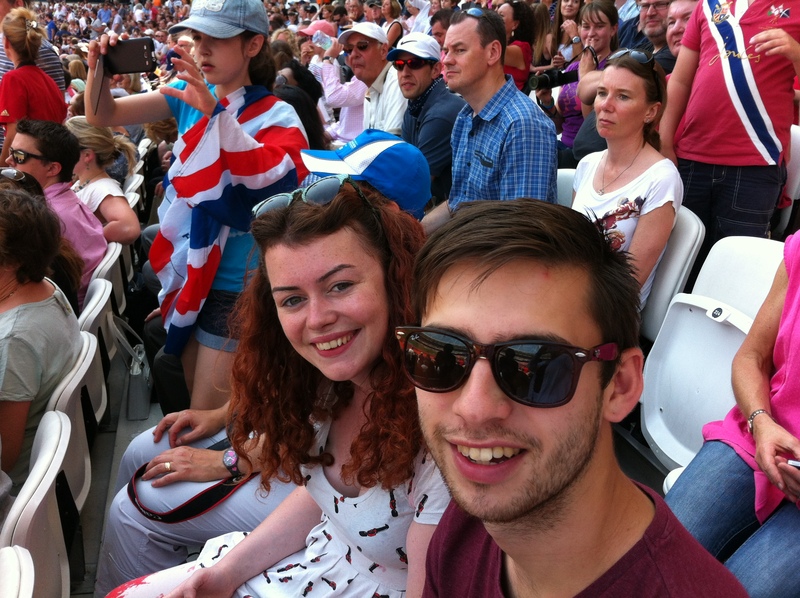 No gamesmakers cheering us on or keeping energy high and most people not adorned in their country flags. The park itself is part building site now – with some venues having been taken away or dug up. 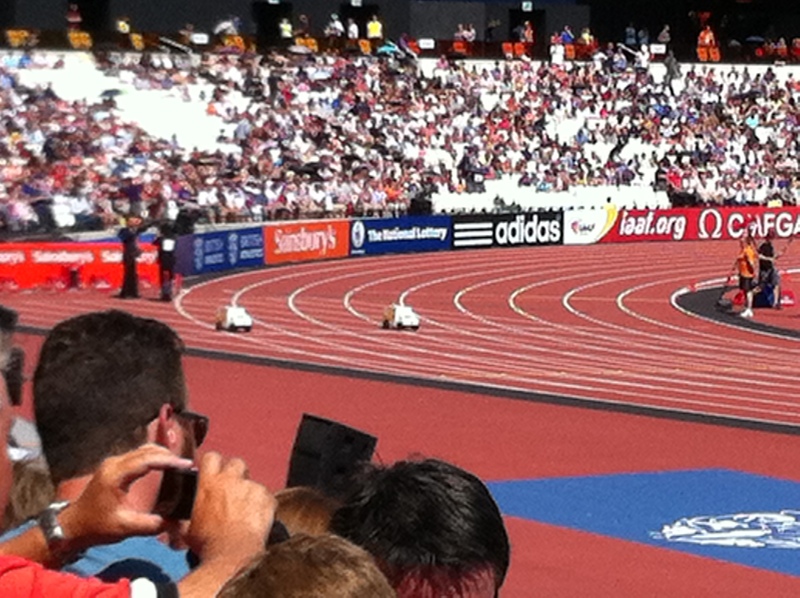 But eventually we arrive in the stadium in to fantastic seats on the home straight just before the finish line. About ten rows back from the front. awesome. .
And the stadium is packed to the gunnels again. I still love all the stuff that goes with an athletics meet that isn’t really anything to do with the running and jumping and throwing. The military precision with which the hurdles are put out and put away is a highly choreographed dance. Admittedly performed by people who look surprisingly undancey or unathletic. But impressive nonetheless. And the little remote control vehicles used to return the javelin or shot to the contestatnts after they have given it their all. At the Olympics they were little minis, but today being sponsored by Sainsburys they are little delivery vans. We see Jessica Ennis-Hill run the hurdles right in front of us and compete in the long jump over the other side of the field. Seeing these athletes close up is so much more impressive than on the television. The sheer physical ability. The highlight for me was Mo Farrah. The place went absolutely mental for him every time we caught sight of him; doing interviews trackside beforehand, warming up, and of course blasting round the 3000m leaving the rest of the field for dust. I felt Katarina Johnson-Thompson missed out somewhat as the young Brit won the long jump at exactly the same time as Mo won his 3000m so all the focus was on Mo and she got sidelined. The crowd were not as loud as at the Olympics and more partisan it seemed to me. The audience were here to support the Brits and everyone else got a fairly lukewarm response. Apart of course from the man himself. Usain Bolt. Huge presence in all senses and he brought home his relay team with awesome ease. Inspiring stuff. And so it was we tried to leave the Park to get on the tube home but the hyperefficiency of the Olympics was no longer here and the queues were terrible so we peeled off and attended Open East a festival in the adjoining park. Inflatable Stone Henge, various bands, food stalls and a drag show could not compete with our enjoyment of watching small children racing on a 40 metre track. All fairly relaxed and informal, they just randomly lined up in lanes and ran when the guy shouted “Race”, but they loved it. Who says kids don’t like competing? Sink the Pink at Open East festival. More fit bodies but slightly different use of them. Eventually we hoped the crowds would have died down enough to get on the tube and we headed back to Ealing. Youngest was ‘feeling for a pie’ so we tried booking in to the North Star but no tables for an hour, the Duke of Kent didn’t pick up so we tried the Grove. What a good choice. No pies unfortunately but everything we had was really enjoyable. Well cooked, well presented and tasty. More restaurant than pub food really, but still with a pubby atmosphere. And that was it – three events on the Saturday and still another day of the weekend left! First night back after holidays and we are out again but this time to the theatre. I haven’t read the book but heard great things about the show so was keen to see it whilst the main guy is still playing the lead. The set and production are bloody impressive. Walled with graph paper we are invited in to the world of Christopher, a 15 year old ‘on the spectrum’ with Asperger’s or similar autistic difficulties and an ability to do maths. The book is written in the first person and this adaptation uses his lovely teacher (Niamh Cusack) as his voice a lot of the time as she has got him to make a play about his ‘detecting’ so she is reading from his writing. Having found his next door neighbour’s dog speared with a garden fork, Christopher sets about finding out who killed it. This uncovers a tangled web of deceit, lies and emotional relationships which is confusing for him . He likes straight lines, logic and the truth, He does not understand why sometimes it is easier or kinder to lie as he cannot. This is intense theatre with Luke Treadaway magnetic and mesmerising and physically adept. The choreographed scenes are beautifully and cleverly done and although there is meant to be some humour, I did not find myself laughing very often as this was in many ways a tragedy. Seeing the world through his eyes – the confusion and panic when it is all too much for him and he starts moaning and covering his ears is heart rending. But it satisfies one of my requirements for theatre; it made me think. And reminded me how difficult the world can be for others. And as we sat in a little bar afterwards we all realised we were those unpleasant, exasperated commuters brilliantly evoked in the second half and I think we all hope we will be a little more tolerant and understanding. Until the next tourist stops in their tracks immediately in front of me, or wanders aimlessly from side to side not allowing me to overtake, or nearly knocks me flying with their rucksack…………. Definitely worth seeing. So why only three and a half stars? I’m not entirely sure, but I think it is something to do with there not really being any light or shade. That it is so full on all the time. That it is all about him and the other characters are relatively shallow and stereotypical. But that’s exactly how life is for him, so it is in many ways an unfair criticism. But at the end of the day my star ratings are about my over all enjoyment and the clapometer stops at three and a half. This blog post title refers to a song hubby used to sing to the children – and they loved it. It is a raucous Dubliners song about a man who returns home the worse for wear every evening and all the evidence of his wife’s affair is ridiculed by her as being due to his inebriation. Lovely nursery stuff. He only ever did five of the nights as they get too rude for under tens, but on our week long tour of the West of Ireland, one of the many, many bands we saw did the whole seven and brought the house down. We landed in Cork and spent the first night in Clonakilty – home of the famous black and white pudding. Which we unfortunately had as a starter for our first evening meal. It was billed as a terrine of black and white pudding with a tomato relish. A slab of tasteless pap arrived in a disgusting Marie Rose sauce circa 1973 prawn cocktails. My steak was no better nor hubby’s fish, so we were made more wary of all the accolades from the various guide books including the Michelin one. Perhaps this was actually the Michelin one for rating what to do with old tyres rather than for good cooking. So a very disappointing start. But luckily the evening was saved by traditional singing in a tiny pub. Locals taking turns singing with musical accompaniment as required. Some cracking party pieces and impressive to watch and hear the handing down of these tales – often about their history, or losses or drunkenness -to the next generation. We moved on to Glengarriff, to another fairly anonymous hotel but again the music came through loud and clear. Not to mention the beauty of Bantry Bay and the surrounding area – surprisingly bathed in glorious sunshine. The following few days were based in Dingle – the most fabulous party town with bars and live music and clubbing even on Sunday nights. Good food here – particularly at the Global Village, but others were tasty too. And the wonderful beaches – huge wide sweeping miles of fine white sand. We revelled late in to the nights and lay sleeping on the beach on the day. This could be Ibiza not Ireland. And finally to a shushi hotel in the centre of Galway. All plush furnishings, velvets and chiffons, great showers, cocktail bar and huge bed. More live music every night and in loads of places – including a 15 piece orchestra crammed in to the window of a bar – absolutely awesome and all for free. Well, the cost of a few drinks you’d be having anyway. 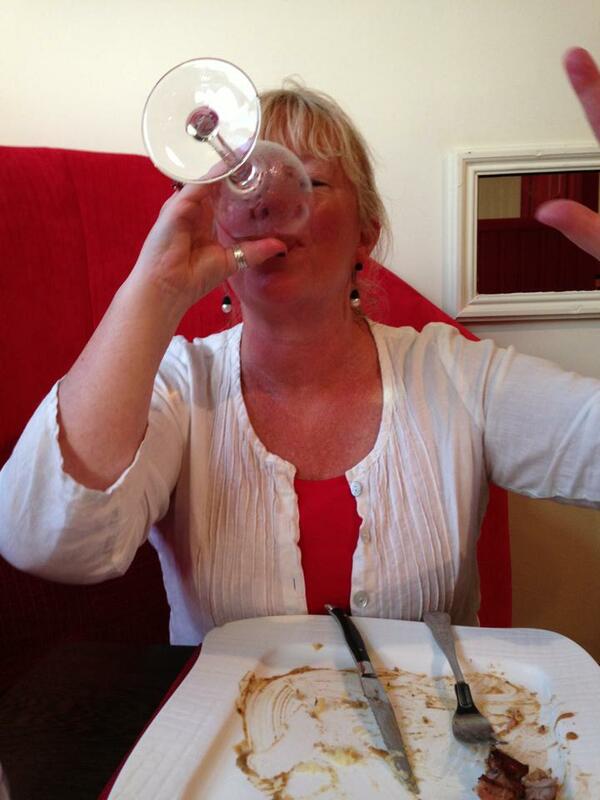 Two more meals out – and I have to be honest I am starting to struggle now with eating so much and drinking so much day after day after day. So we head back to the hotel for a nightcap and he squeezes two more whiskeys in. I may be full. But he’s the Full Irish. I am an immediate gratification kind of person. If I want something done, I want it done now. If I am hungry, I want to eat now. Similarly with work if I am asked to do something I want to get it done as soon as possible, but of course there is always more than one thing that I am being asked to do at any one time and so I have to prioritise. Left to my own devices I prioritise based on what I find most enjoyable. I put off the jobs I fancy the least. It is nothing to do with how difficult they are or how big, or how time consuming. Just how likely I am to enjoy doing them. And I take my enjoyment where I can get it. So in fact clearing out my entire inbox and responding to every email can be therapeutic and cathartic and as such enjoyable. Similarly the inbox that sits in my various ZINC accounts can be cleared with relish. In contrast, my office has needed clearing out and tidying up for months. And I keep setting aside time to do it and then, what do you know, something more interesting comes along. I mean, I could be doing it now but no, a blog post is much more attractive. And required! I haven’t posted for days and need to get something out there. I always have to justify my putting off something by making what takes its place vitally important. Or at least more important than what I can’t be arsed to get on with. And of course, as soon as I finish this post I will start on the office. Well, I will after I quickly research some stuff that might be quite useful for a presentation I’m doing in a couple of weeks…………. I had been at a pedestrian comprehensive where the vast majority of people left as soon as they could. Some would go to tech, but very few aspired to University. My sister had been one of only three people in the upper sixth, so you can see there was not a huge stimulating debate to be had in the common room. I had enjoyed school – cruising along doing very little and spending most evenings and weekends doing paid work in shops, hotels and bars. Played hockey, learnt some instruments, did some acting and messed about with boys. That was about the sum of it. I wanted to leave school at 16 and either do hotel and catering or act. My parents (particularly mother) were not keen. They had both been to University and expected me to go too. But I couldn’t think of anything I wanted to study. And anyway, I wanted to leave school. However, that changed after spending a couple of months in hospital during the fifth form (year 11). I had to have lots of physiotherapy and I thought that looked quite a fun job and it might keep mother off my back about going to University. Unfortunately it meant staying on to get A levels but I kind of resigned myself to that. I don’t remember being keen to go away to sixth form college, but the initial application process meant a day off school so what’s not to like? I turned up for interview with the Director of Education along with about ten other hopefuls. We were being given a preliminary interview to see if the county would fund one of us to go to an international sixth form college which at the time cost about £10,000 a year. The other applicants were all in their prissy school unforms and eager to please. I, on the otherhand, was wearing a midi length flared brown skirt with button pockets, a brown and cream striped, ribbed V-neck jumper from Van Allan, a brown fake sude jacket with faux fur collar, huge brown platform shoes from Lilly and Skinner and black painted nails. I used to love that outfit, disgusting as it sounds. I got in to the sixth form college and from there it became an assumption that I would go to university. Much to my parent’s relief. But still I thought I might do Physio or Drama. Until my mother had a long talk with me. Firstly, you can do acting as a hobby and if you really like it, do it after University. Secondly, although physiotherapy is a great profession, she felt I had the brains to be a doctor. The academic requirements were higher for doctors than physios, so if I were able enough I should apply for medicine because otherwise I would be taking a physio place that someone else could have had. And the chances are that the person whose place I had taken would have been someone whose dream it was to be a physio, who had worked hard and strived to get the neccessary A levels, but because I didn’t feel like pushing myself I had stolen their dreams when I could easily do something else. Something that lots of other people couldn’t do. I had to aim higher or it wouldn’t be fair. She appealed to the altruism of a sixteen year old – and it worked. It was very clever of her. I didn’t realise she had done it till much later. It never occurred to me to say “But I WANT to do physio, or I WANT to act.” And I don’t hold it against her. I had a great time doing my degree and have enjoyed my career ever since.